How do I figure out the installation height when a large and a small dog will share the door? The door must be installed at a height tall enough for the tall dog to pass through without hitting their back, yet low enough for the short dog to get over the threshold. Plan the installation height from the inside of the house, not outside the house. This is because there’s usually a drop down from the inside to the outside – even if you measure from the foundation, the flooring adds to the difference in elevation. Measure the tallest dog to the top of their back. If it’s difficult to measure, call the dog to stand next to you and mark the height on your own leg with your finger. It’s easier to measure yourself than the dog. Adding two inches to this measurement will give the desired top opening height. Then, measure the smallest dog from the ground to its belly. The bottom of the pet door opening should be no taller than this height. Now you know how high the door must be to accommodate your tall dog. The next step is figuring out if the small dog can get through. Measure your smallest dog from the ground to the belly. If the dog is too short to use the door, you can put a small step in front of the door. It needs to be small enough to not get in the big dog’s way, but large enough to help the smaller dog through. 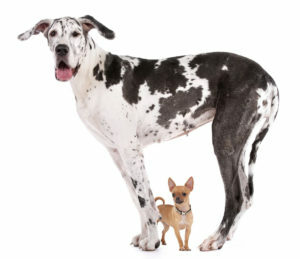 Or, purchase a larger dog door, so it can be installed closer to the floor but still be tall enough for the big dog. Another thing to consider is, there’s usually a drop-down from the inside of the house to the outside of the house. You may have to add a step on the outside as well.